The Astronomy Group runs jointly with Cardigan U3A. It was started in July 2014 and meets monthly at 2pm on the 3rd Wednesday of the month in the Coracle Hall, Llechryd. The Leader of this group is Adrian (Cardigan U3A) who can be emailed by clicking on the "Birdie". The group caters for those new to the subject and new to observing the skies and also for those with a bit more experience in both areas. Basically an ad-hoc group, we meet and discuss whatever anyone wants to cover in any area of astronomy. So far, members have given short presentations on the Moon, Mars and Jupiter for discussion by the group and other members have given demonstrations on how telescopes work, are set up and are used. We have talks and demonstrations given by different members of the group. There is now WiFi available in the hall so we can explore some stunning websites. 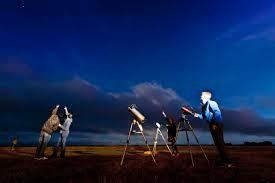 Further observation sessions are to be held approximately monthly depending on the night skies. Here are three sites that may be of interest. Current information can be found in the monthly Newsletter.